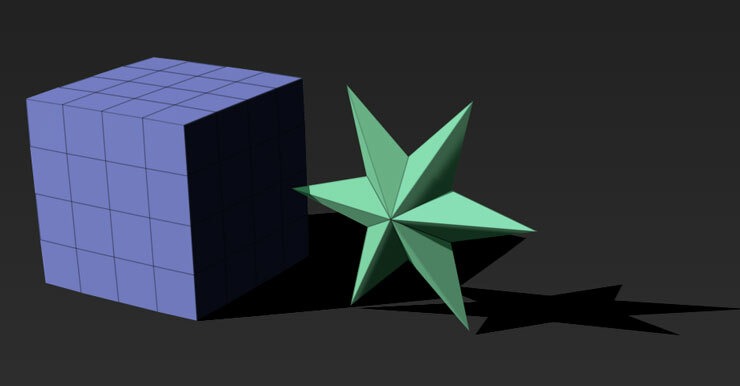 A polymesh is a 3D model that is composed of polygons. A polygon is a shape that is enclosed by a number of points connected by edges. The polygons are connected to each other to form a sort of net (or ‘mesh’) that defines the shape. The whole shape can be open, where some edges belong to only one polygon, or closed, where all edges belong to two polygons so that the mesh is watertight. ZBrush uses polymeshes that are composed of quads (quadrangular or 4-sided polygons) and tris (triangular or 3-sided polygons). The Quick Mesh feature will let you create a starter mesh with a single click. You can then subdivide and sculpt this right away or use it as the start for the ZModeler brush. To learn more see the Quick Mesh page here. To learn more about the ZModeler see the ZModeler pages. If you start with a ZBrush primitive, or use ZSpheres or ZSketch to create your model then you will need to ‘skin’ the model so you can sculpt it. Your model must be a polymesh before you can use the sculpting brushes. For the ZBrush primitives you can do this using the Make Polymesh3D button. For ZSpheres and ZSketch you can use the Adaptive or Unified Skin options. If you import a model into ZBrush that you have created in another program then it will already be a polymesh. You will be able to sculpt it with the sculpting brushes and add multiple subdivision levels.